Located in the basement of No. 868 Huashan Road, Shanghai Propaganda Art Center is a private museum owned by Yang Peiming. 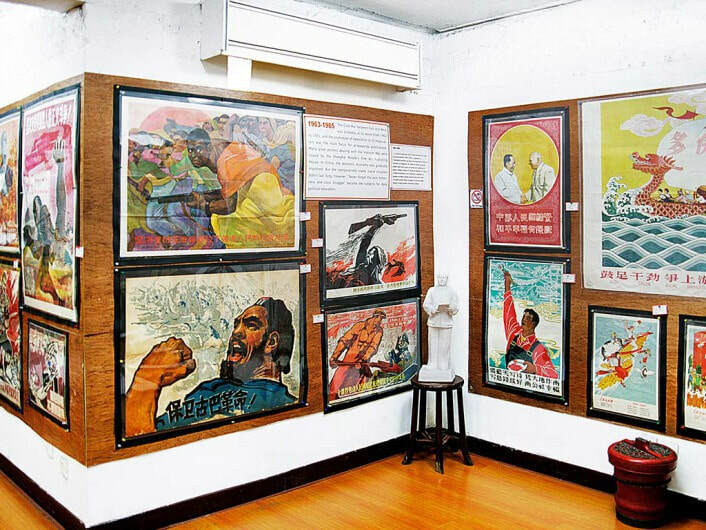 It offers more than 400 posters, including the calendars from the 1910s and the posters during the Cultural Revolution. Shanghai Propaganda Poster Art Center is divided into three areas, and each area's posters are classified based on a certain historical period. You can find the old calendars The first period from the 1910s to the 1940s in China. Some are rare in the existing market, such as the calendars with the the then stars on - Hu Die and ZHouxuan. The calendars on which the female model with different hair style and clothes during different periods of time present the change of the times. Even, you will see the artistic images of some naked or semi-naked female models on the calendars between the 1930s and the 1940s. In addition, the center offers the New Year paintings in the early liberation period, posters in people's commune period, "Great Leap Forward" period, "Cultural Revolution" period, and post-Cultural Revolution. These posters reflect the prominent political themes at that times, which attracts foreign visitors. As it is not popular among Chinese people, you can visit it at any time during the opening hours. There are several buses passing by the art center. Therefore, there are several options. Take Bus 48, 113, 328 and Bus 548 to the Stop of Huashanlu Wukanglu (华山路武康路站). Then, walk to the center. It is not allowed to take photos at the center. Interested in visiting the Shanghai Propaganda Poster Centre on a Tour? Wendy Wei Tours offers a variety of different packaged tours as well as custom tours including the Shanghai Propaganda Poster Centre, among other attractions and destinations. To find out more, please visit our Tours page or Contact Us directly to find out more.